Our Rosemary & Mint body care set is a blend of nature’s pure ingredients designed to exfoliate, cleanse, and hydrate all skin types. 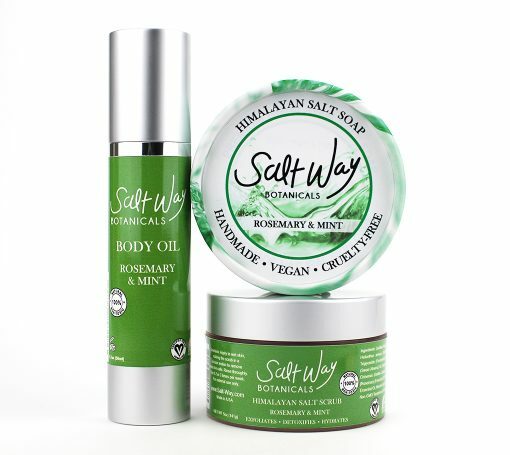 The set includes one salt scrub (5 oz),one salt soap (3.9 oz), and one body oil (1.7 oz). 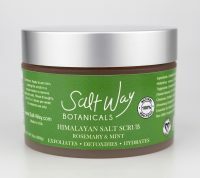 Himalayan salt scrub exfoliates, softens, hydrates, and nourishes the skin. Our scrubs promote healthy, silky, and radiant glowing skin. Himalayan salt is a natural cleanser and detoxifier. 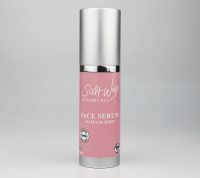 It removes dead skin cells, deeply cleans pores, and improves circulation. The refreshing and aromatic blend of rosemary, peppermint, and spearmint essential oils provide a cooling effect on the skin and increase the blood flow. It is a wonderful stress reliever and has many skin healing properties. Our mineral-rich salt soaps are handcrafted the old fashioned way from scratch. 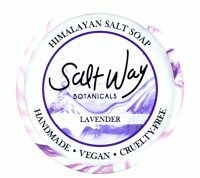 Made with salt mined in the foothills of Himalayan mountains. Free from pollutants and toxins. 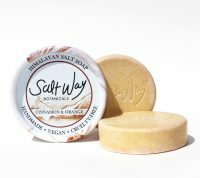 Salt Way Himalayan salt soaps gently exfoliate the skin and leave it clean, soft, and refreshed. Enriched with shea butter, almond oil, jojoba oil, and essential oils. 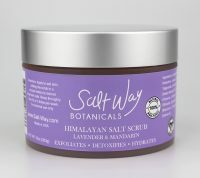 Himalayan salt balances moisture content, improves circulation, remineralizes and draws out toxins from the skin. 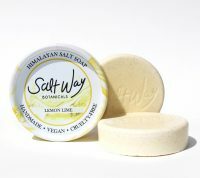 This salt soap has a rich, creamy, and abundant lather. Our Mint soap contains a refreshing blend of Peppermint and Spearmint. This stimulating blend awakens the senses and promotes circulation. It truly makes a great addition to your daily skincare routine. This lightweight and fast absorbing body oil moisturizes, protects, and smoothes the skin. Our precious blend of Jojoba,Sunflower, Coconut, Camellia, Apricot, Elderberry and pure essential oils nourishes and hydrates all skin types. A refreshing and aromatic blend of rosemary, peppermint, spearmint, and lavender awakens the senses and provides the perfect way to naturally moisturize your skin. Formulated without: Animal products, petrochemicals, parabens, fragrance, artificial dyes, phthalates or sulfates. Ingredients: Certified Pure Himalayan Salt (Fine Grain), Helianthus annuus (Sunflower) Oil, Caprylic/Capric Triglyceride (Fractionated Coconut)Oil, Prunus Dulcis (Sweet Almond) Oil, Vegetable Glycerine, Simmondsia Chinensis (Golden Jojoba) Oil, Rosmarinus Officinalis (Rosemary) Essential Oil, Mentha Piperita (Peppermint) Essential Oil, Mentha Spicata (Spearmint) Essential Oil,Non GMO Tocopherol (Vitamin E).Ingredients: Cocos Nucifera (Coconut) Oil, Certified Pure Himalayan Salt, Distilled Water, Olea Europaea ( Olive) Oil, Sodium Hydroxide (Saponifying Agent), Unrefined Butyrospermum Parkii (Shea Butter), Simmondsia Chinesis (Jojoba) Oil, Prunus Amygdalus Dulcis (Sweet Almond) Oil, Rosmarinus Officinalis(Rosemary) Essential Oil, Mentha Piperita (Peppermint) Essential Oil, Rosemary Powder. Ingredients: Helianthus Annuus (Sunflower), Simmondsia Chinensis (Golden Jojoba) Oil,Caprylic/Capric Triglyceride(Fractionated Coconut), Camellia Oleifera Seed Oil,Prunus Armeniaca (Apricot) Kernel Oil,Sambucus Nigra (Elderberry) Extract, Rosmarinus Officinalis (Rosemary) Essential Oil, Mentha Piperita (Peppermint) Essential Oil, Mentha Spicata (Spearmint) Essential Oil, Lavandula Officinalis (Lavender) Essential Oil, Non GMO Tocopherol (Vitamin E). Getting the sets are so worth it. I wish this set also included the face oil! Copyright 2019© Salt-Way Inc - All rights reserved.